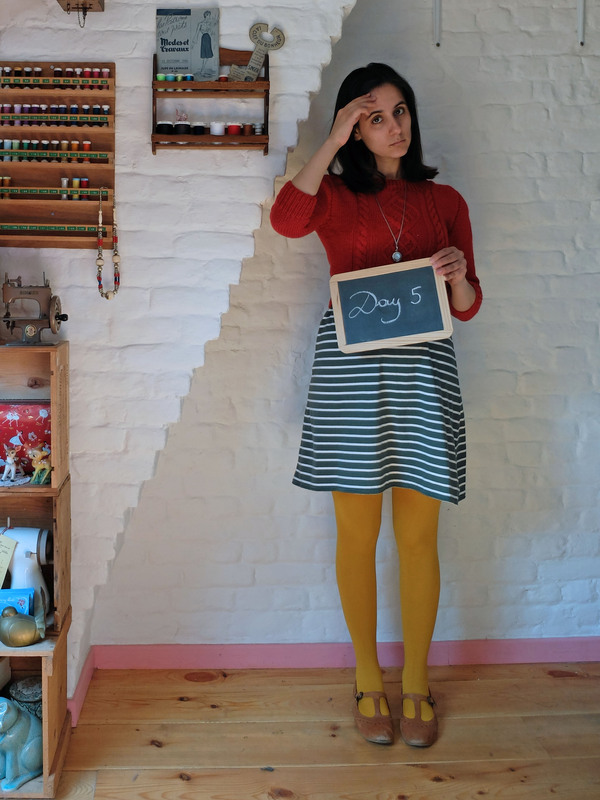 More than half the month is over, and I’m still having fun putting outfits together! I could do without the pictures of course, but even that I find less of a hassle than last year because I’m a little better organized. A comfortable outfit for a very long Monday. I love how there are some tiny flowers on the dress that are the same colour as the sweater. What else can I say that I haven’t said already? 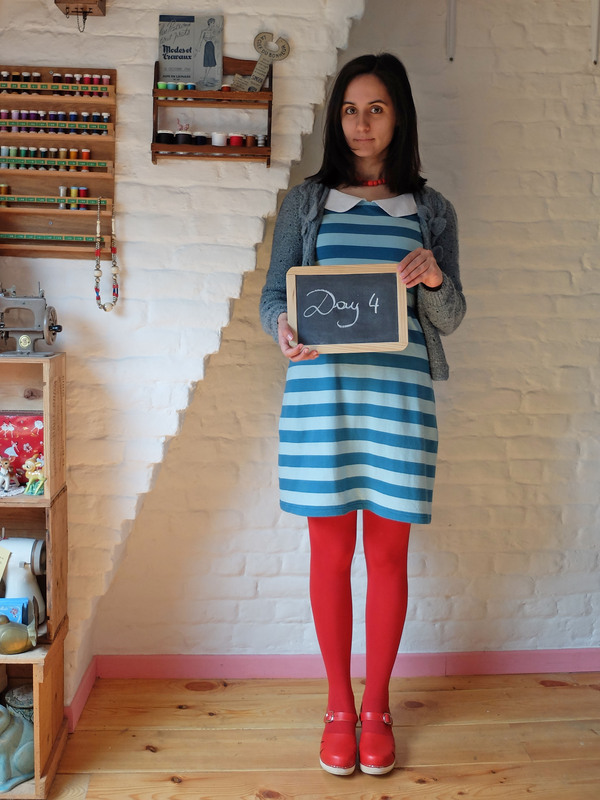 It’s the second appearance of the dress this May, and already the third of the sweater and they’ll probably both come out again before long. I love that outfit. Yes, it’s a pretty positive me-made week! 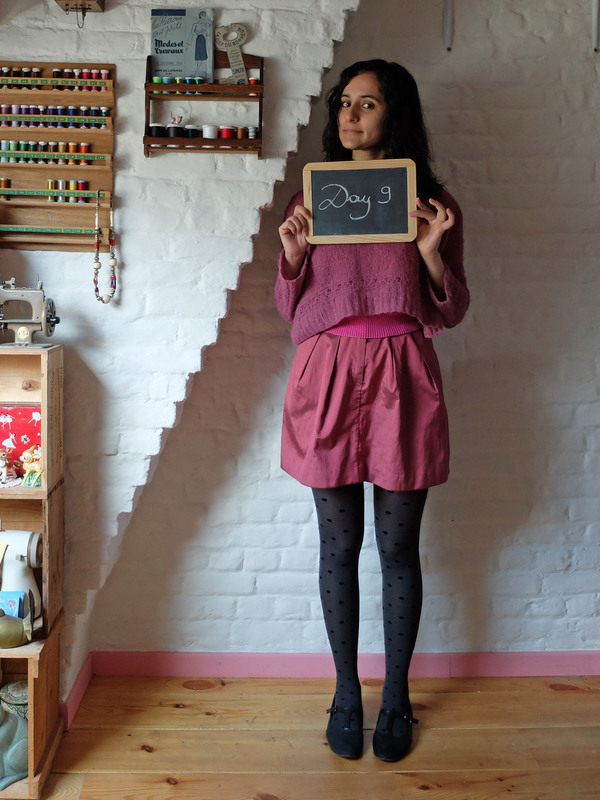 😀 It seems like Deer & Doe’s Sureau and Andi Satterlund’s cropped sweaters and cardigans are a match made in heaven: my favourite outfit from last week was another Sureau and Andi’s Miette cardigan (Day 6). 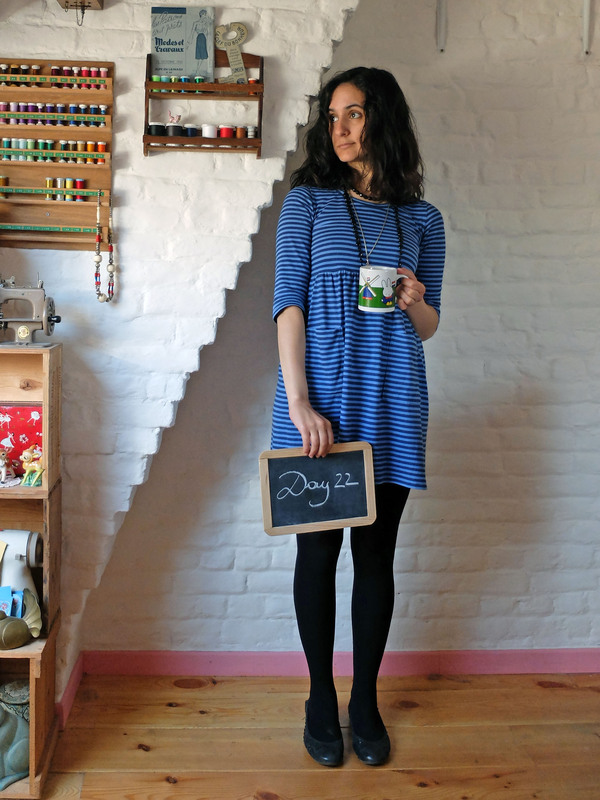 The dress, sweater and shoes are me-made. Still the greatest feeling on earth spending your day in me-made shoes! I took a second picture coming back from work because I was wearing the usual me-made jacket and shawl just like every day, but also my fingerless mittens. Not that you can see them very precisely in that picture of course, but I love them and I always carry them in my bag just in case it gets chilly as on that day. 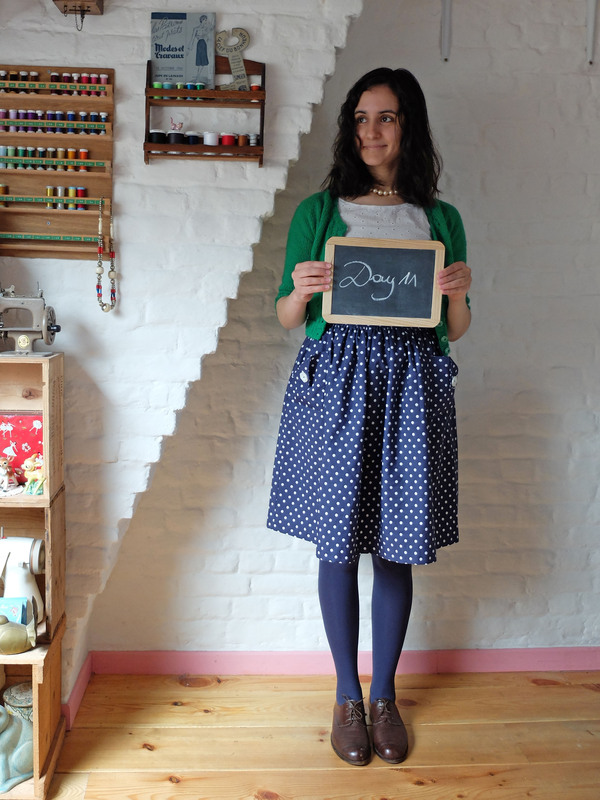 A combination of skirt, blouse and cardigan I wear very often. I really don’t know what more to say except that I should make another Hollyburn, another Miette and another Sencha because I really love those patterns. The only thing I don’t like about that outfit is the fact that both the blouse and cardigan have synthetic in them. It’s not that much of a problem for the cardigan because it’s a blend and I never wear it too close to my skin, but the blouse is clearly 100 % synthetic and although the fabric is really pretty and it almost never wrinkles, it’s also not breathable at all and it smells much faster that any piece of clothing I’ve ever owned, which is not ideal when you bike everywhere! Now that’s a combination I had never thought to make, but I suddenly realised there were flowers on the fabric of the dress that were reminiscent of the colour of that cardigan, so the outfit went from there. This is the kind of surprises I love in Me-Made-May! Friday is supposed to be my day off, but I exceptionally had to work on that day, so I tried to stay positive by dressing cheerfully nautical. It kind of worked! 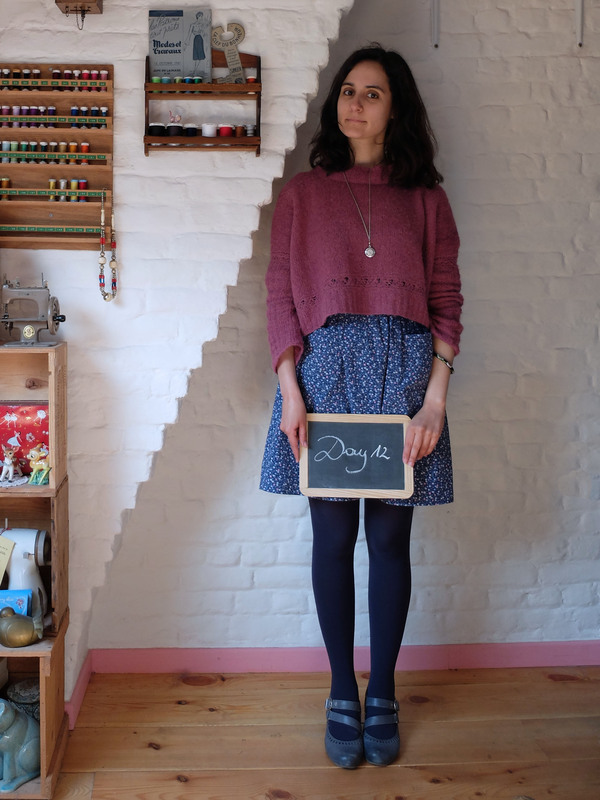 I’m wearing a me-made skirt, blouse and cardigan. 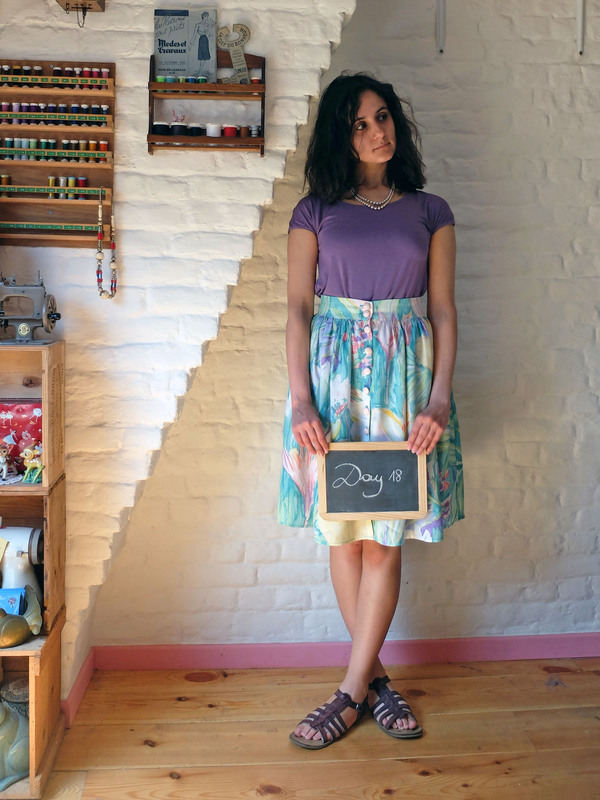 I’m wearing a me-made tee and a new skirt. 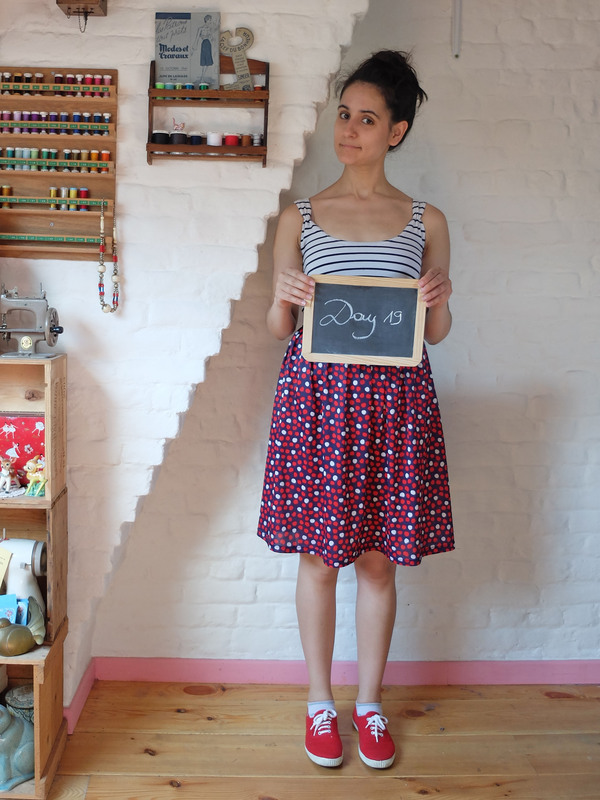 This is kind of a sneak peek of the skirt, so I won’t tell more about it except that I made it following Tilly’s Picnic Blanket Skirt tutorial. I wore that outfit to go to a yard sale under the sun and the whole time I couldn’t believe I was wearing sandals and no tights! When the sun got down, I put on a me-made cardigan. It’s weird how different my hair looks in the two pictures by the way: I swear I took them on the same day! Oh, and sorry about the bra lines, one of the perks of that thin rayon knit. – My me-made wardrobe is much fuller than I thought at the beginning of the challenge. One third down! I’m quite surprised at how natural it’s been feeling until now, and I still have some unworn me-mades in the closet, yay! Well, we’ll see how I feel about that in a week! Ah, feeling much better, both physically and sartorially! This is an outfit I wear very often and I love it. 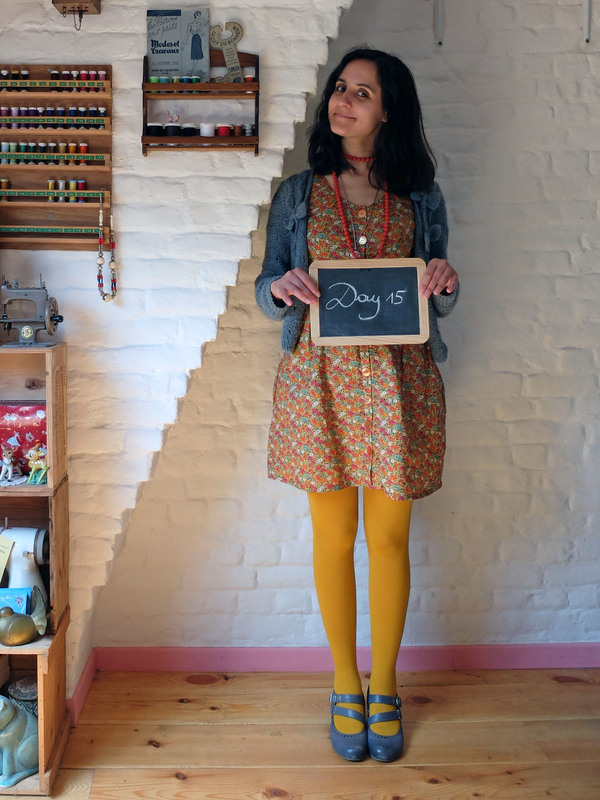 The shape, the colours, the comfort, the fact that I made my shoes… Both the dress and cardigan are among my most worn me-mades. The cardigan is made from what I thought was a low quality yarn, but it seems like I was wrong when you see how well it’s been holding up. The buttons on the other hand have faded like crazy, but I don’t really mind. Another favourite outfit to get back on my feet after the disaster that was Monday! 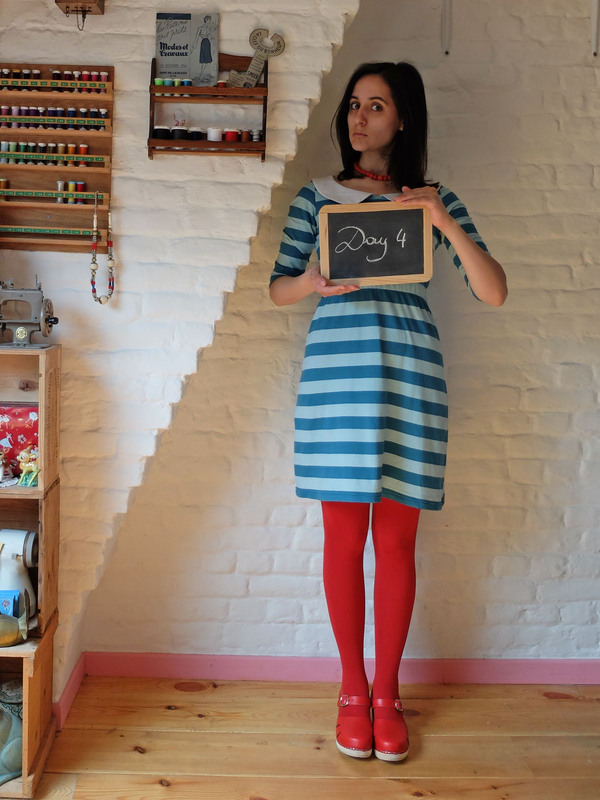 The dress (see MMM’ 13 – Day 1 for more information) and cardigan are me-made and really belong together I think. Also a very comfortable outfit, though not ideal for getting rained on while biking from work (but what outfit is, really?). My tights are normally a shade lighter but they (as well as my shoes and the skirt of the dress) were drenched! 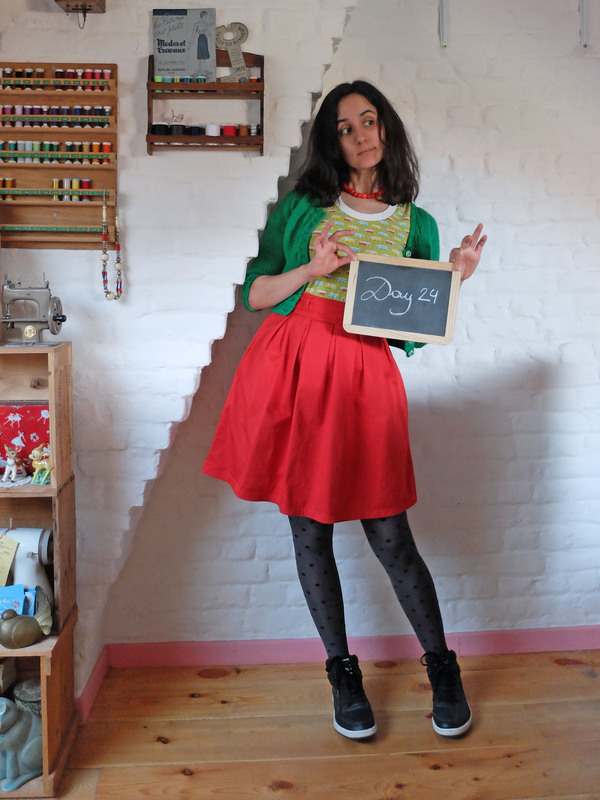 I had never thought of wearing that skirt and that sweater together, but I liked this outfit very much. The top I’m wearing under the sweater is also me-made. I felt very comfortable and cheerful all day. To think I almost threw that skirt in the trash for some silly detail I don’t even remember! I’m wearing two sweaters with it: the one you see best was one of my most painful knitting experiences but it’s been so worth it since I wear it all the time (this is already the second time I’m wearing it in May! 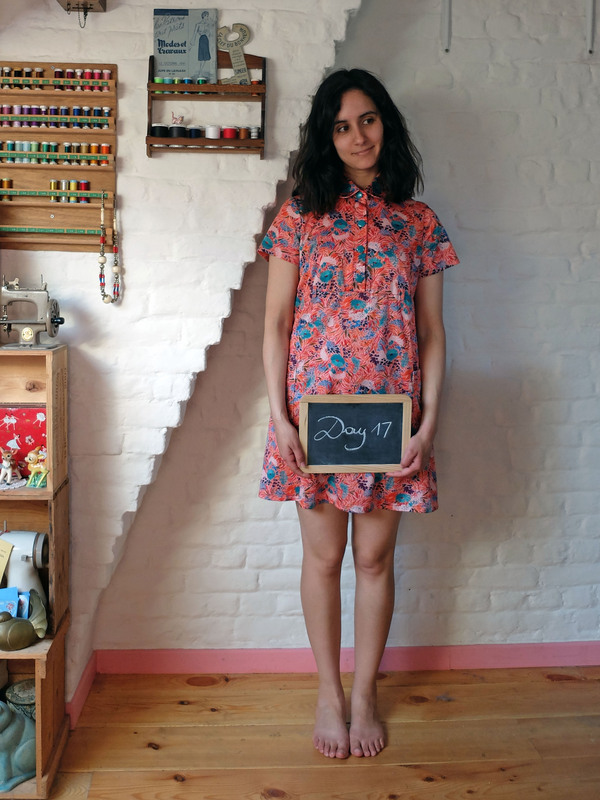 – and this is my first garment repeat of the month), and the one I’m wearing under it used to be restricted to summer, until I realised how much I liked it worn under the other one. 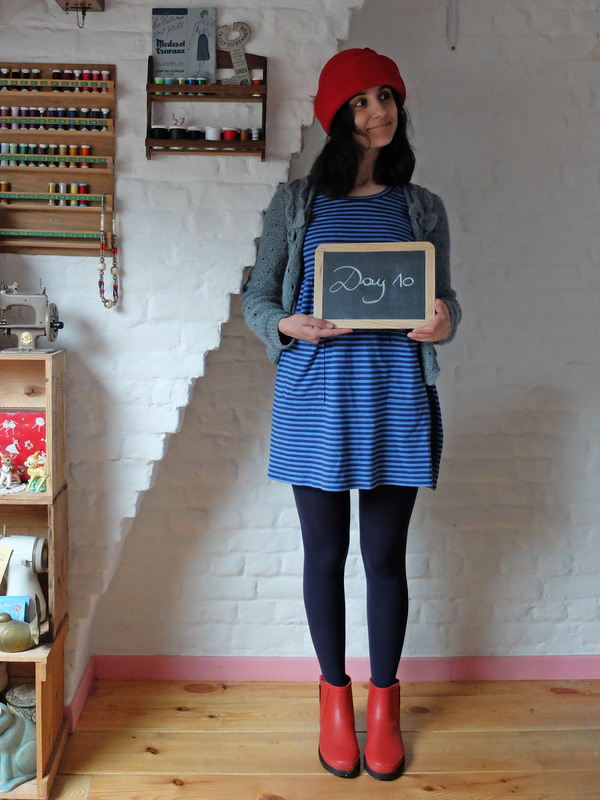 The dress, cardigan (second repeats of the month) and hat are me-made. It was raining again, hence the rubber boots. I thought about taking a picture of my outerwear for once! These are the jacket and shawl I wear literally every day except in summer. The acrylic shawl is now five years old and still going strong! 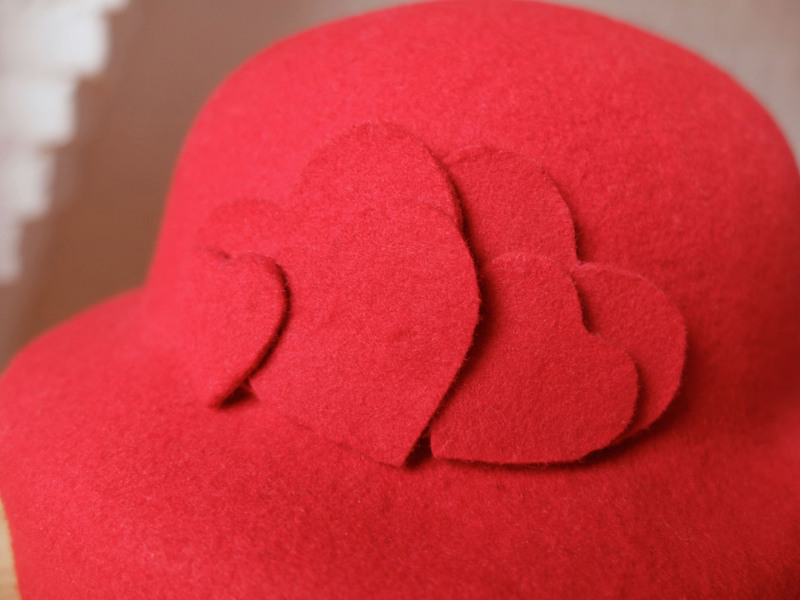 I made the hat in February, for Valentine’s Day, but I hadn’t worn it yet because I thought it was a bit too tight and uncomfortable, so I wanted to cut the lower part and make it into more of a bowler hat. But I felt like wearing a hat on that day, preferably red to go with the boots, so I tried it on again… and wondered what was wrong with me the first time I tried it on! It fits pretty good, and its shape makes it stay on the head very securely even when there’s a lot of wind like on that day. I think I could even wear it on my bike! 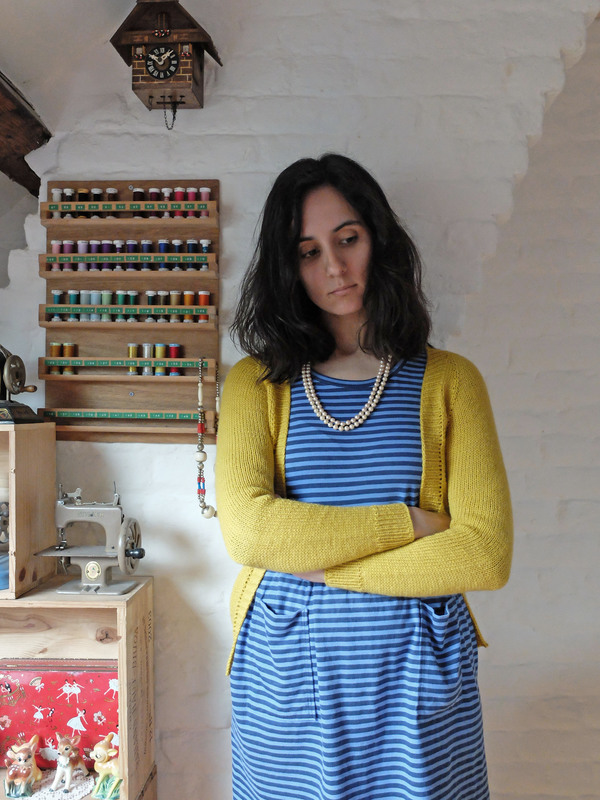 I had planned a day-long date with my sewing machine and I was wondering what to wear to stay at home, but I had completely forgotten I was supposed to go to one of my best friends’ housewarming party! Luckily when she didn’t see me coming she sent me a text, so I grabbed the first garments at hand that kind of seemed to go together, took a picture and jumped on my bike to head to my friend’s place. I was pretty happy with my outfit, especially seeing as I really didn’t have time to think about it for too long. It was actually much more flattering in real life, but the way I’m holding the blackboard hides my waist and makes me look much thicker than I really am. Ah well, it’s already kind of a miracle that I even took a picture, so I’m not complaining! You’ve already seen the blouse (see Day 1) and cardigan (see Day 6 this week) this month, but it’s my first time wearing the skirt. 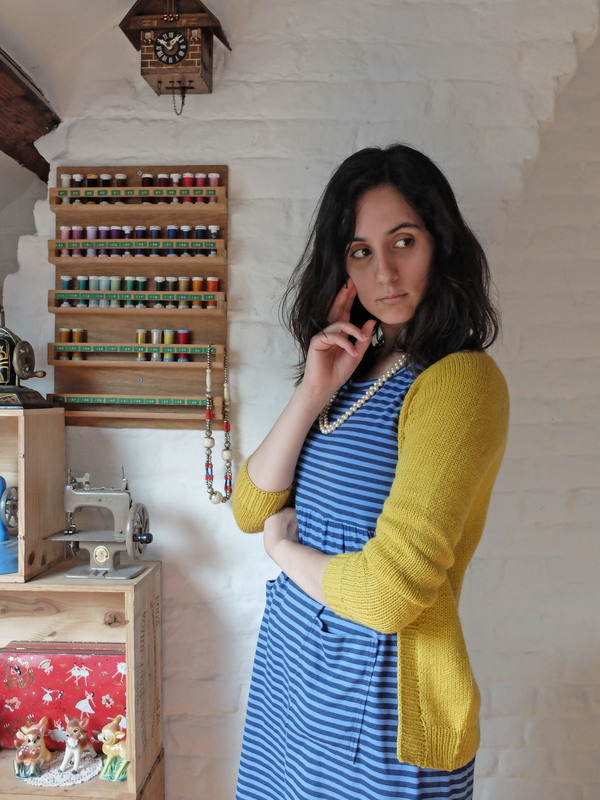 I think I’ll manage with what I have for a month, but I wouldn’t mind a few more cardigans. 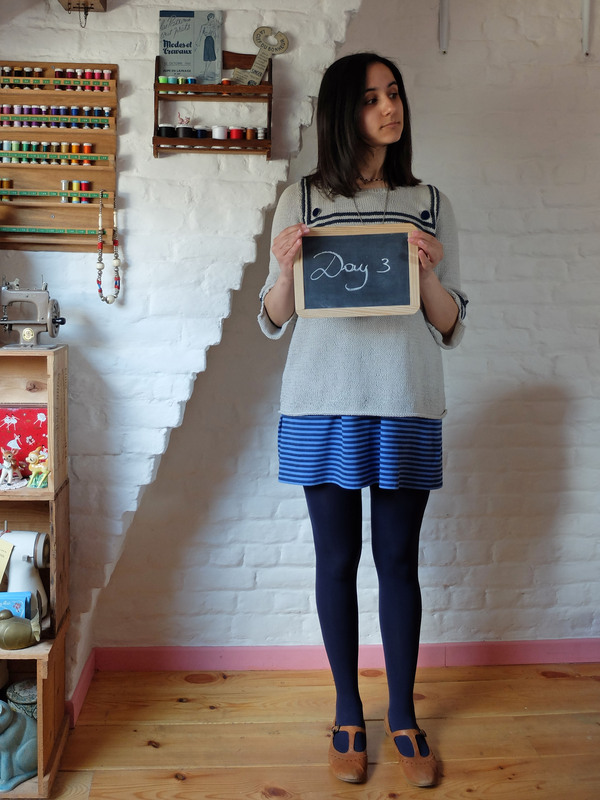 You are about to see the three I own and my Winter Heather sweater a lot this month! Four days into May, this hasn’t been too difficult yet. Especially since I haven’t had to go to work: I don’t work at weekends, nor on Fridays this year, and May 1st was a holiday, so four days at home left me plenty of time to plan my outfits and take the daily pictures. 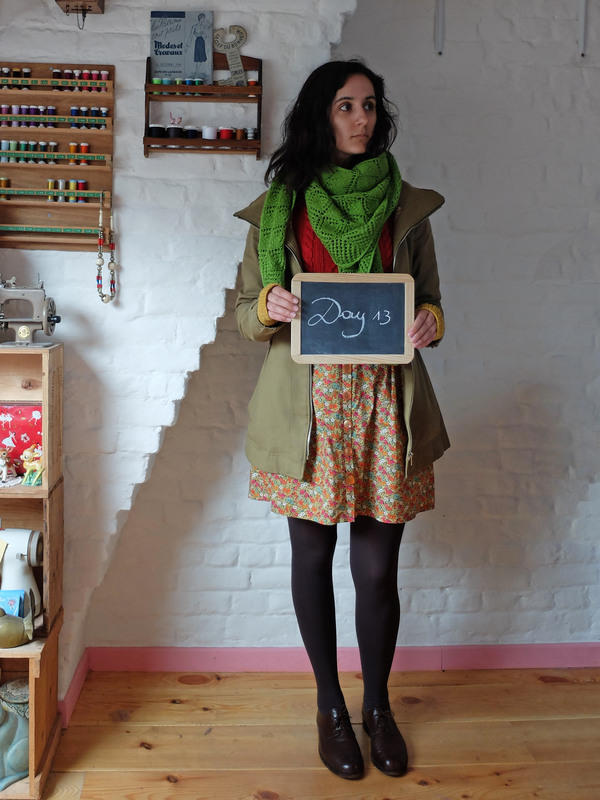 In addition to what you see in the pictures, I also wore my me-made jacket and shawl every day, every time I went out. 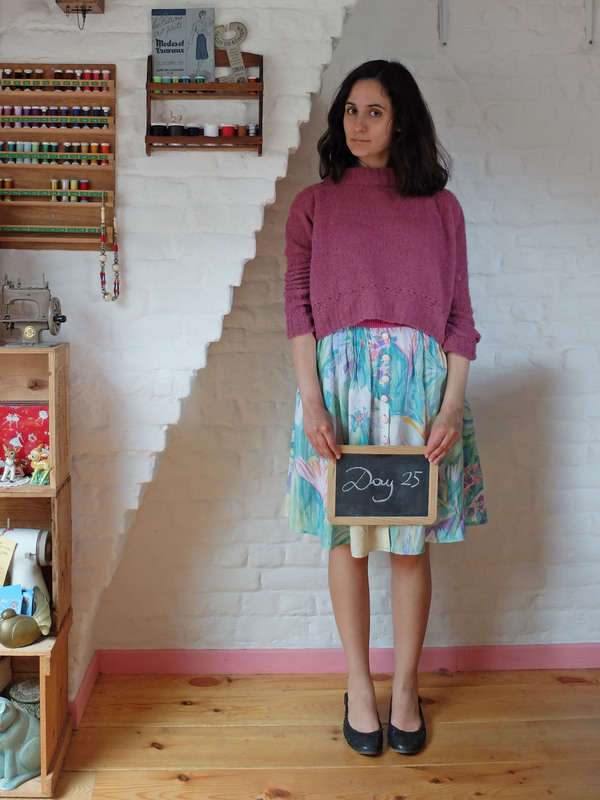 Hello, favourite skirt and sweater! This is a combination I’ve been wearing a lot these days, except I usually wear a store-bought black long or 3/4 sleeved tee under the sweater. 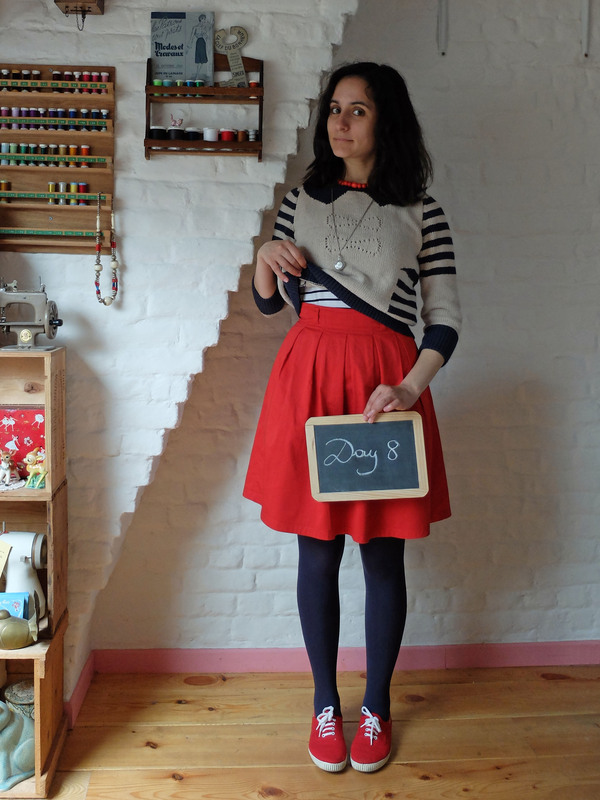 This time I substituted a me-made blouse (pattern from this book) for the tee and I was really pleased with the result. This blouse is the first piece of clothing I ever sewed, so I don’t wear it often, but I can’t part with it and I still wear it every summer. 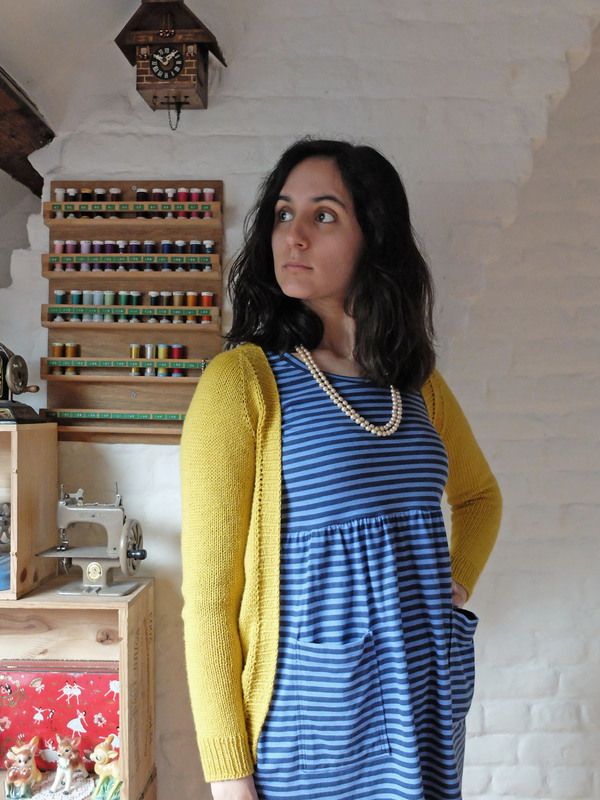 I’m wearing a refashioned dress and a sweater I recently knit. I’m wondering whether I shouldn’t shorten the sweater a touch, even more than what I already did, because its body still has a tendency to bunch up a bit under the arms. 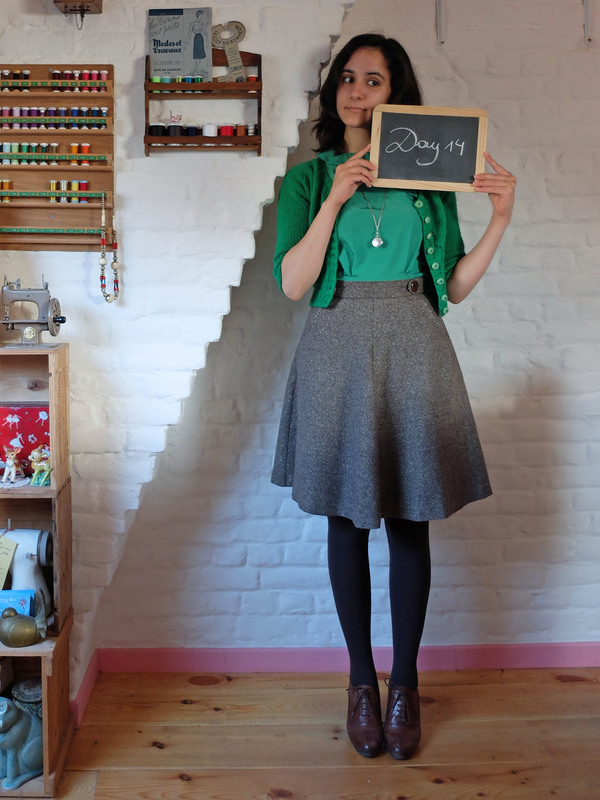 This is the kind of outfit I would never wear to work because of the short skirt, though I have no problem wearing very short dresses/skirts outside of work as long as I’m wearing tights. Oh, and if you’re wondering why my hair looks better behaved than usual, I went to the hairdresser’s that day. Anyway, I’m wearing the first sweater I ever knit and a Renfrew dress you may remember from not too long ago. The sweater has become a little too big for me and I don’t like the fact that it’s polyester (made from recycled bottles, that I like! 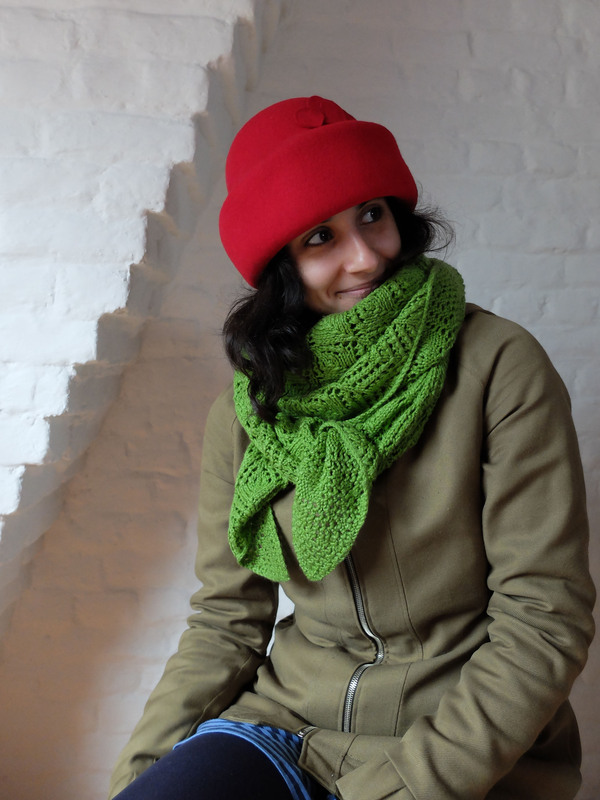 ), but I still love it so much, I’m pretty sure I’ll knit another one in a better yarn someday. 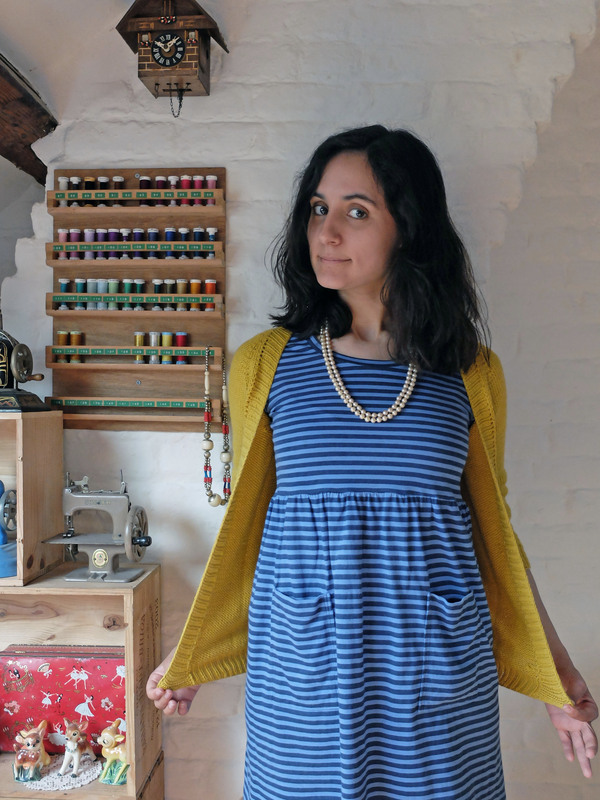 Had it not been for Me-Made-May, I’m not sure I’d have thought to wear this dress and this sweater together, but since I don’t have a lot of me-made cardigans or sweaters that go with the dress, I had to be more creative than usual! 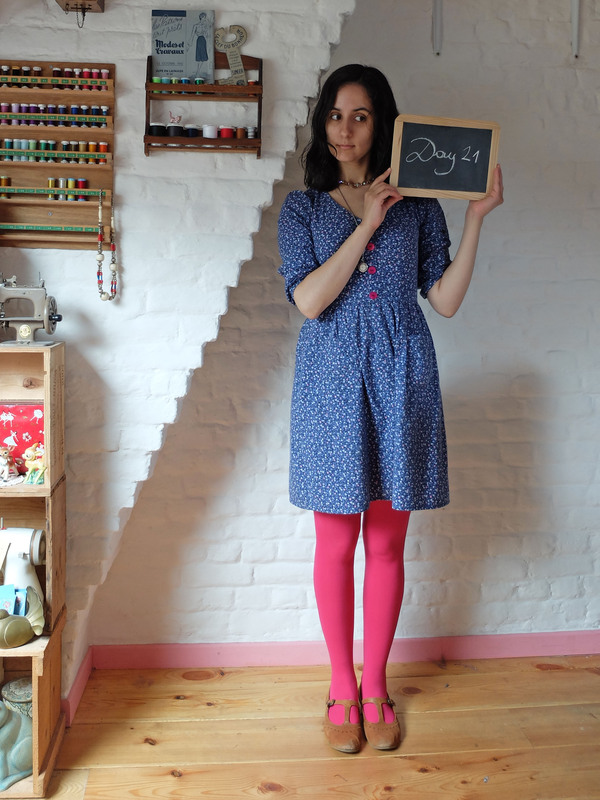 The weather was much warmer than the past few days, so I only wore a me-made dress for most of the day. I still love the style of that dress and it’s also very comfortable, but the fabric has seen better days so sadly I think it will have to retire soon. Ah well, at least it will leave more room for future makes! 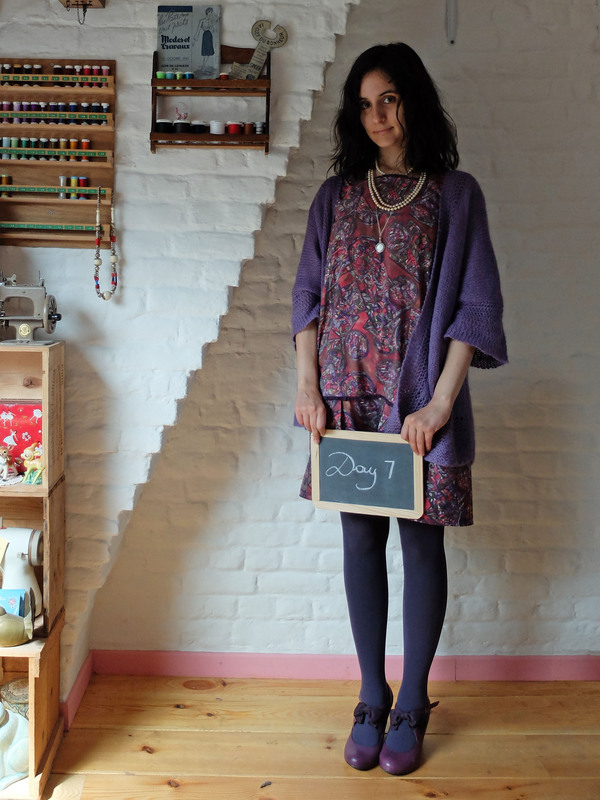 The evening was a bit chillier, so I put on a me-made cardigan I often wear with that same dress. 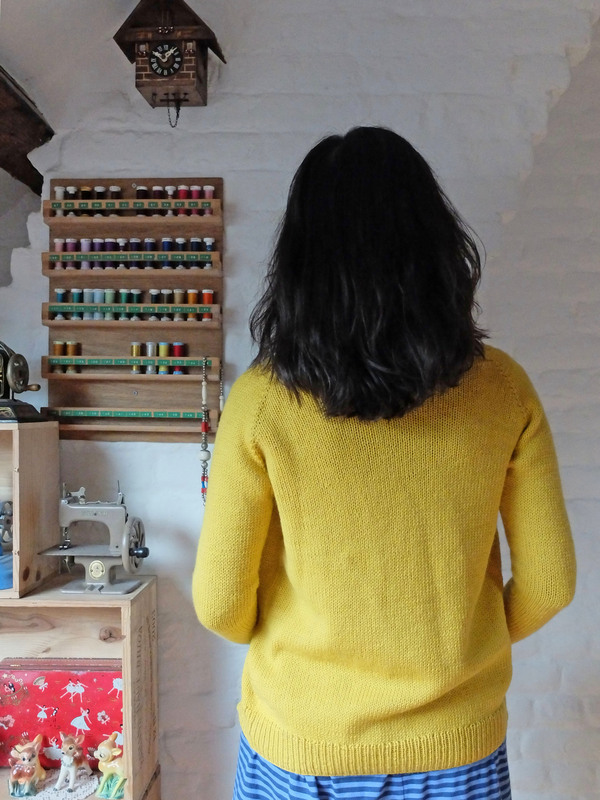 When I made a quick inventory of my me-made wardrobe before I wrote my pledge, I realised I actually only own three me-made cardigans. This is one of them and it has also been showing signs of age, so I’m planning on knitting me some new cardigans in the near future. Seeing as my daily uniform is a dress with a cardigan, I don’t know how I didn’t realise that sooner! 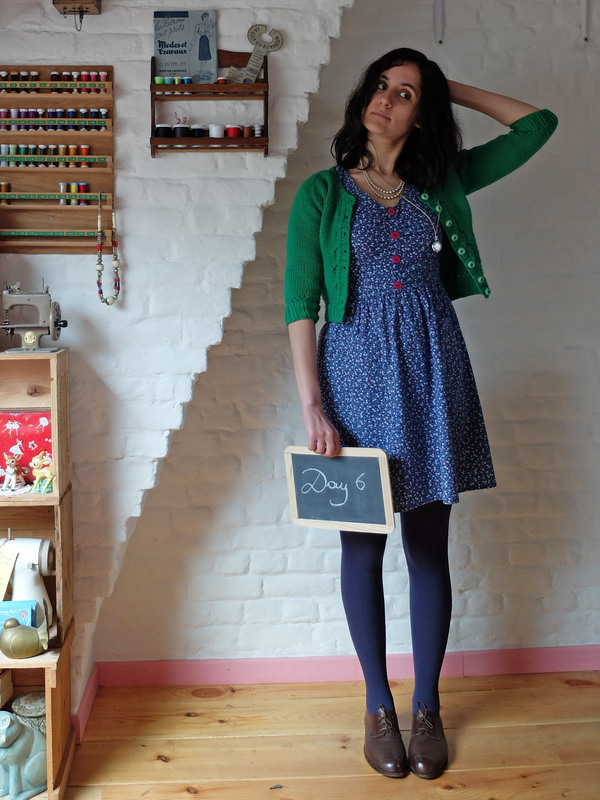 – I need some cardigans! – A whole year is too long a period between two haircuts. 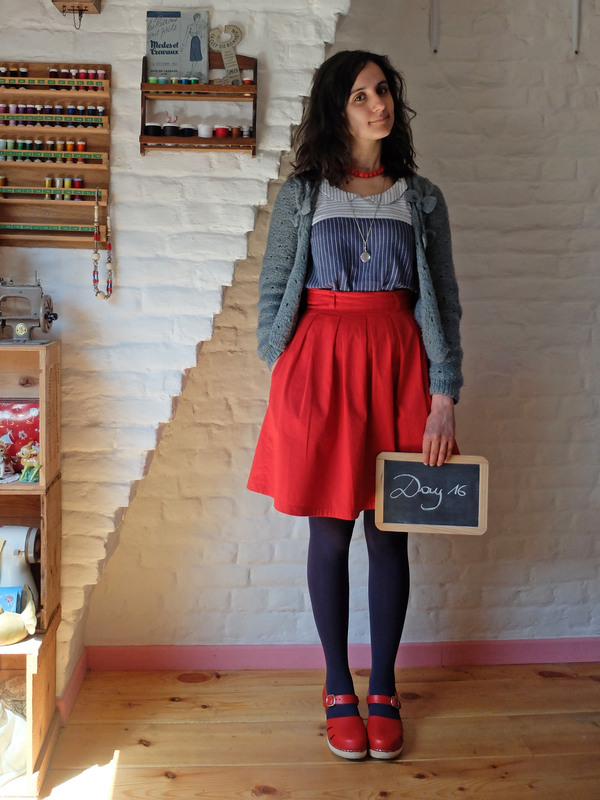 Proudest sewing moment ever: I not only finished a gift on time (which reminds me, a friend of mine is still waiting for the skirt I promised to sew for her birthday in May… 2013!) 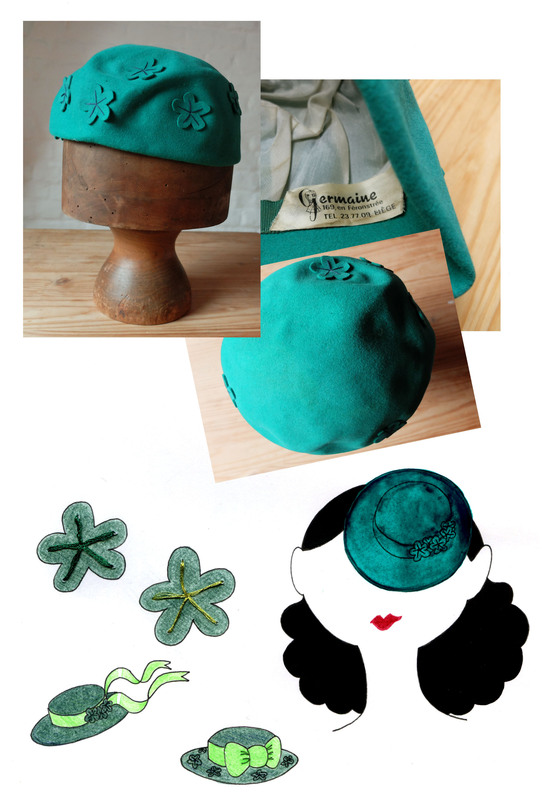 but I also drafted the pattern myself! 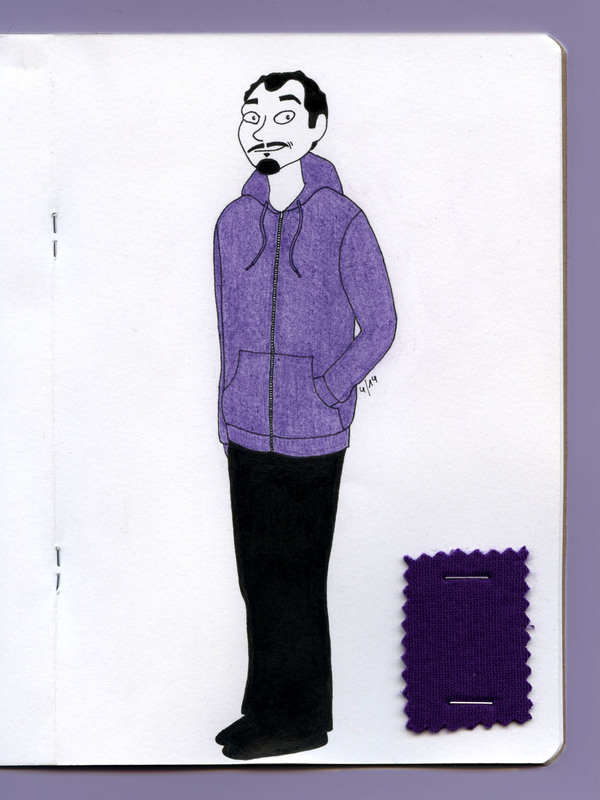 I had planned on simply tracing my boyfriend’s old hoodie (without taking it apart), but this proved to be such a hassle on a stretchy fabric that I quickly gave up on that idea and found myself drafting my own pattern. 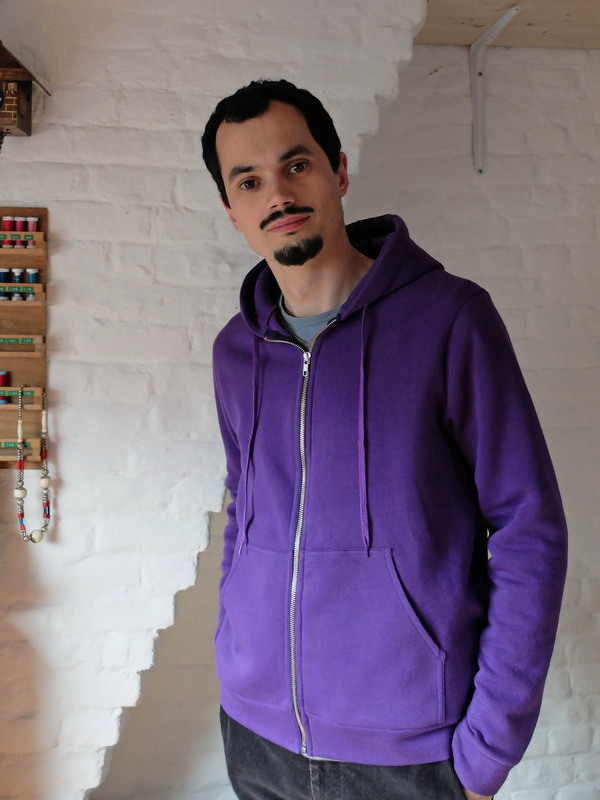 I just used the old hoodie and this pattern I own to check whether the length and width of my pattern were correct, then I drew everything myself with a certain amount of guesswork. 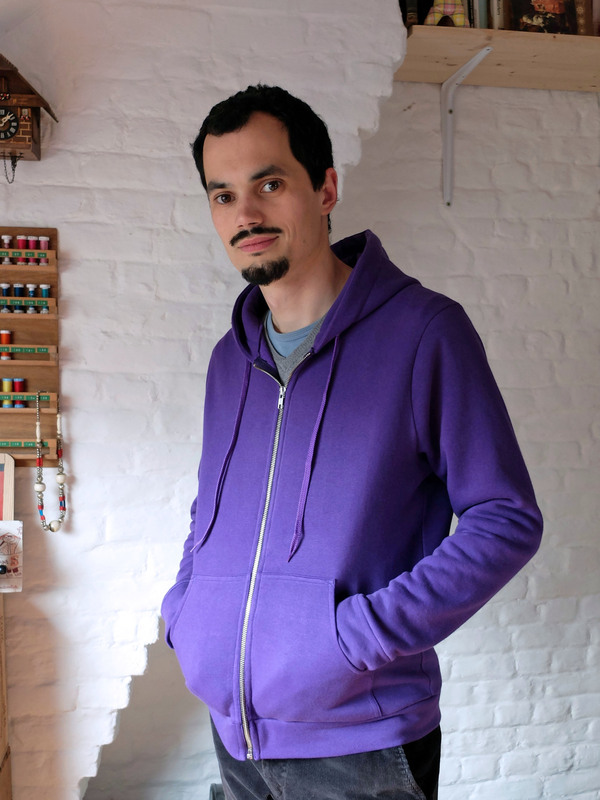 By the way, you read it right: I own a hoodie pattern, yet I found it more appealing to draft my own instead of using that one. I really must hate tracing patterns even more than I thought! 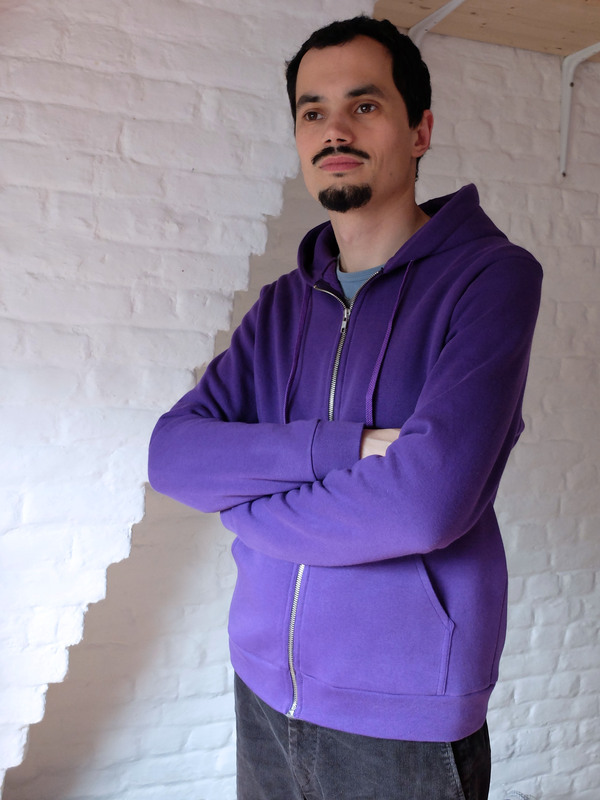 Despite his (constructive) criticism, he still said he was happy with the hoodie and he took it with him to New York and I know he’ll be wearing it a lot, so this is actually at least as rewarding a sewing project as those destined for myself. 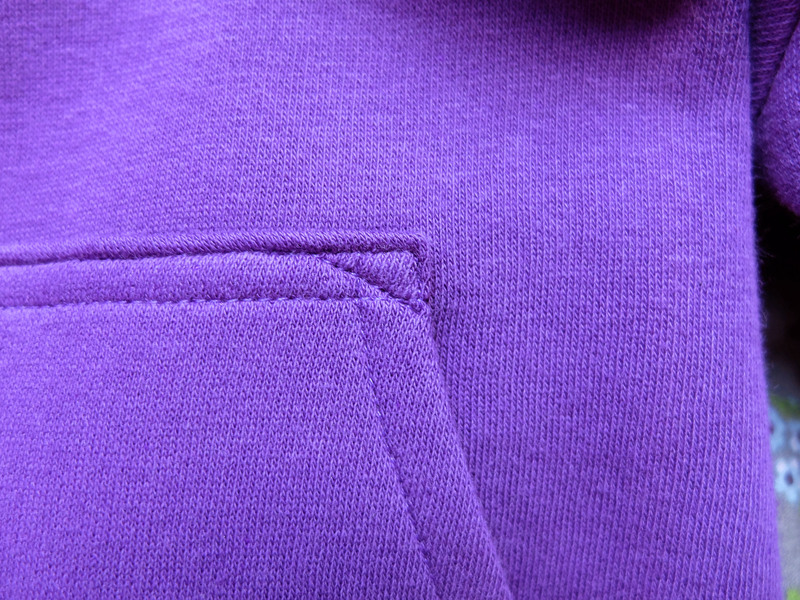 As regards the technical details, I lined the hood and made the cuff and body bands with self fabric: I initially wanted to use some ribbing for the bands, but I didn’t want to bother with finding (or dyeing) the right colour, and mostly I knew Mr Picky would HATE the snug fit of ribbing! I was a little bit afraid the result wouldn’t look as professional as with ribbing, but I was pleasantly surprised! I realised on Sunday that I needed some metal eyelets for the hood lace before I could tackle the next step. Since I didn’t want to wait until the next day for the shop to be open, I delved into my stash in search for a replacement… and found out that I not only had an eyelet plier, but also two whole bags of eyelets in two colours: gold and silver. I had completely forgotten that my mother had bought me those some time ago! 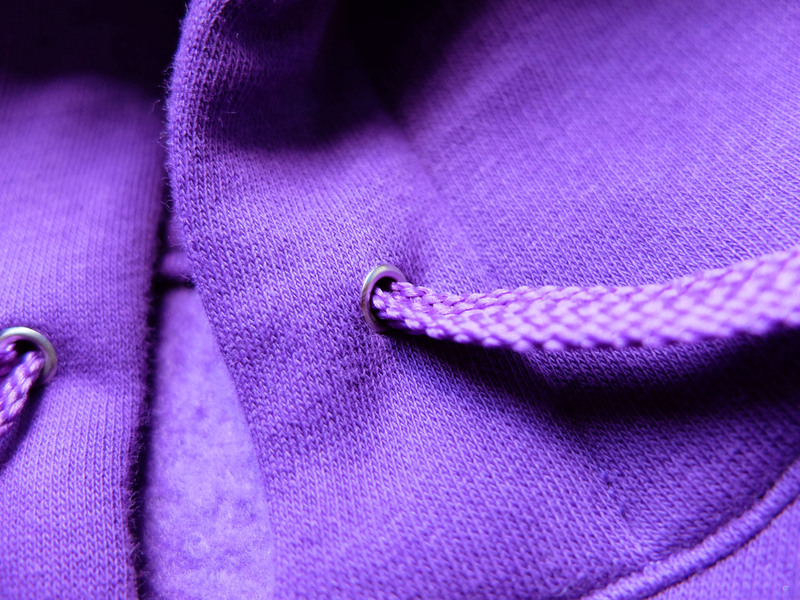 Now that I (know that I) have all those eyelets, it shouldn’t be too long before I replace my own ratty hoodies! Though I don’t think I’ll bother drafting the pattern myself this time, seeing as one of them is so ratty I’ll have no qualms just taking it apart and using the pieces as a pattern! 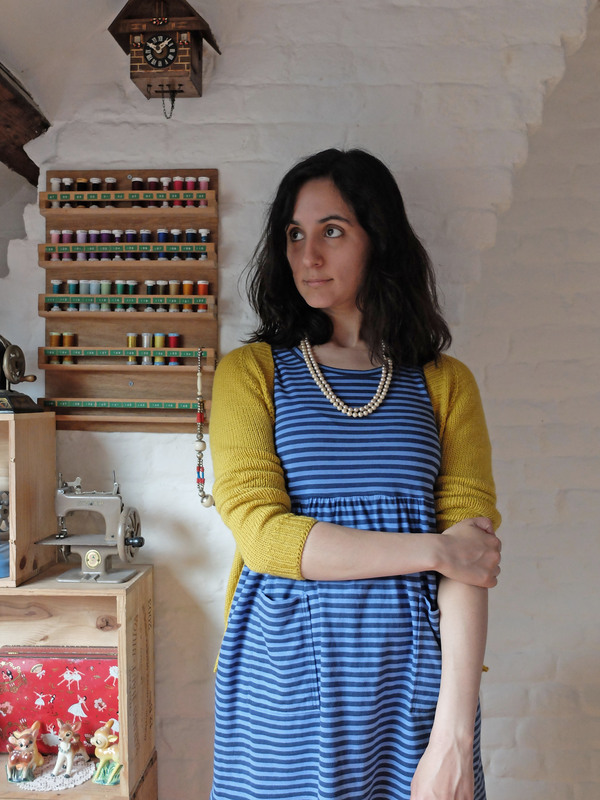 No, your eyes are not playing you tricks, I’m not the recipient of my latest sewing project! My boyfriend, who hates shopping like you wouldn’t believe, had been making hints that he would appreciate it very much if I helped him avoid that chore by sewing him some of the clothes he needed to replace. I wasn’t overjoyed at that prospect because, you know, sewing for someone else, ugh. Plus he is very picky about the comfort of his clothes, and I didn’t want to waste some of my precious sewing time making something that wouldn’t get worn! I knit him a cardigan four years ago, and instead of falling at my feet in eternal gratitude as any normal person would do (a cardigan, for Pete’s sake! 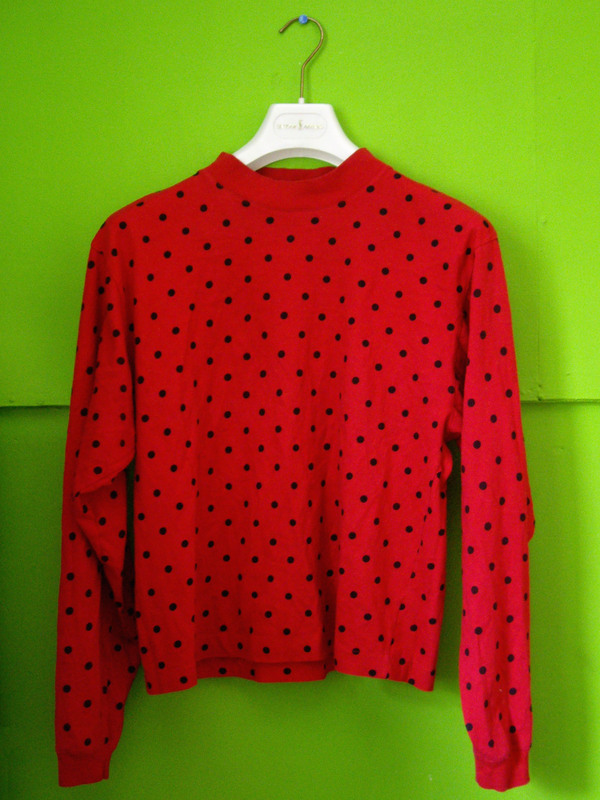 Size XL!!! ), he pointed out that the sleeve ribbing was too tight for his taste. But then again, after I fixed it with some astute blocking, he’s been wearing the cardigan all winter long every year. Just as he has been wearing that fleece headband that took me about five minutes to sew. And he was in desperate need of a new hoodie for an upcoming trip to New York. And I had bought an impressive amount of sweatshirt fabric that was taking an impressive amount of space in my stash. 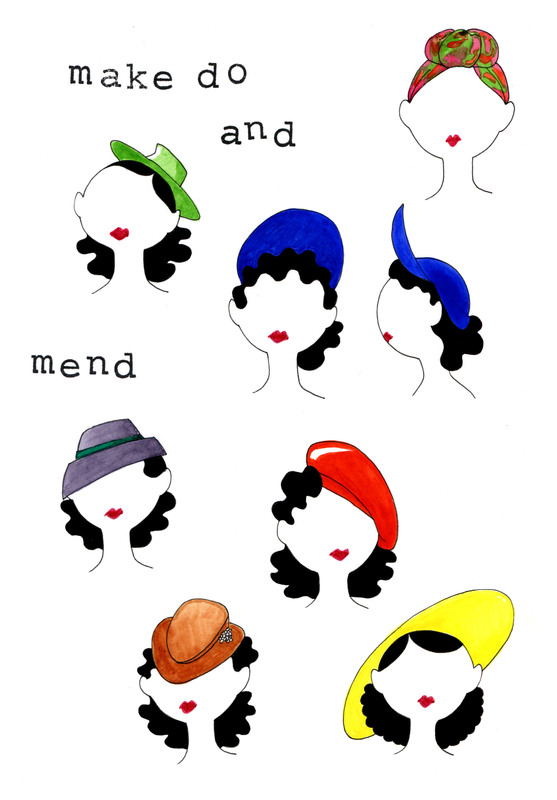 And Thread&Needles had just announced their “Un vêtement masculin” (men’s wear) sewing contest. 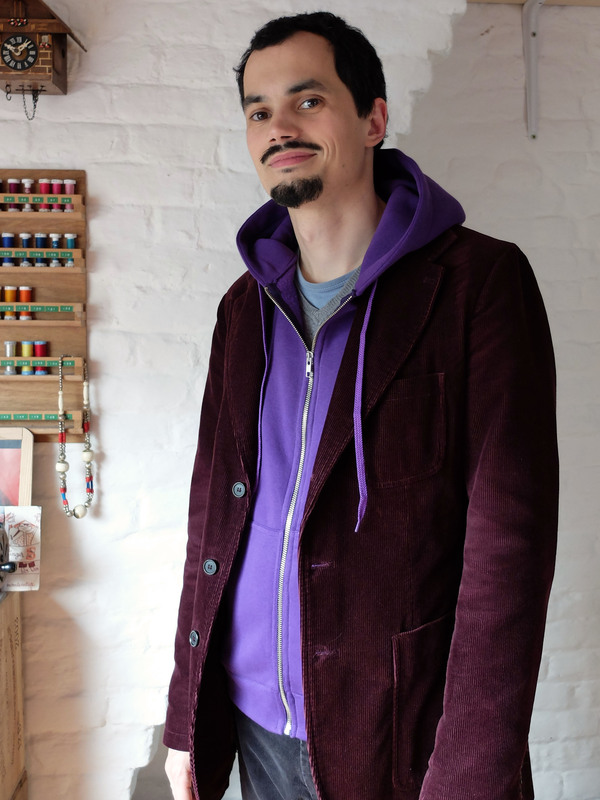 So I set to work and made him a (self-drafted!) hoodie. And I have to say I’m really proud with the outcome, which I should show you very soon since he accepted to pose for some pictures before he and the hoodie left for New York yesterday!